Like the Tony Orlando show, I was completely out of my element seeing Wayne Newton. I'm a rock and roll fan seeing a Las Vegas show, so my review is through those eyes. But, still Wayne Newton is a show business icon. I was only familiar with one of his songs, and that's because it was in the movie Ferris Bueller's Day Off. 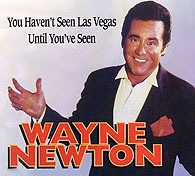 I was vaguelly familiar with Wayne Newton as a cheesy Vegas performer...or so I thought. I knew him more for his movie and TV appearances, like his hilarious role on Ally McBeal. Our seats weren't as good as those for Tony Orlando show, but with the configuration of the stage, there really isn't a bad seat in the Wayne Newton theater. Plus, little did I know that Wayne "works" the room literally! The beginning of the show had enough special effects for a mid '70s arena rock band, with lasers and dry ice. A "spaceman" appeared on a huge set of stairs and "turned" into Wayne Newton! I'm not familiar with his songs (other than "Danke Shoen") so I didn't know the name of the first song. Then he played "Suspicious Minds" going around the room. Newton really worked the room, darting in and out of the aisles to shake hands with audience members, give hugs and kisses, and even startle a fan by stopping and posing for a picture. He told alot more jokes than I thought he would, which was cool because he was truly funny, in a non-political correct way! But, hell, he's Native American so he can get away with it. He played "Unchained Melody" and a few slow songs that I wasn't familiar with. He sat down at the piano and played a few bars of "Great Balls of Fire". Then, "Up Against the Wall Redneck Mother"?!?! He was truly amazing during the show, singing, telling jokes and changing instruments like it was easy. He played piano, guitar, banjo and fiddle during the show. I guess that is the old school of “all around entertainer”? Newton seems tireless, bouncing back onstage to sing, tell jokes and play musical instruments. He continued with "You Don't Love Me" and then Some Spanish song that I wasn’t familiar with. And of course the band was phenomenal! Wayne shared the spotlight with one of the backup singers, who did a version of Willie Nelson's "On the Road Again", then Willie Nelson doing "What's New Pussycat" and Neil Diamond! Wayne followed with "Can't Help Falling In Love With You", "Baby Face", " Danke Shoen " and "McArthur Park". He had a little problem with his voice but still hit the high notes. He was coughing a little so I was amazed that he did an entire 2 hour show!